This train is operated by 885 and 883 series. I would like to share the information about this train in this post. 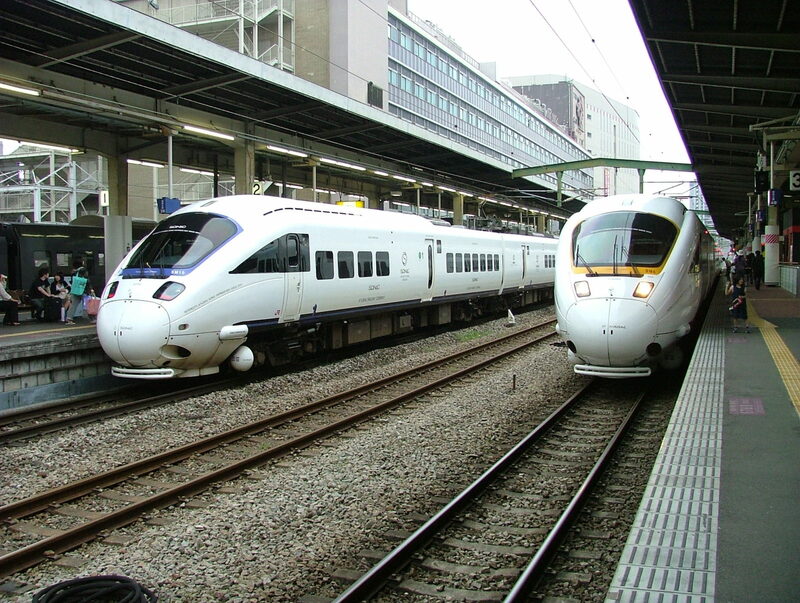 This express train connect Hakata with Oita in 2 hours and 30 minutes, and connect Kokura with Oita in 1 hour and 30 minutes. Sonic services run every 20 to 40 minutes for daytime. In most of season, more than 30 round trips are operated a day. You can check the timetable at JR Kyushu website (English). Sonic is operated two types of fleets, 885 series and 883 series. 885 is newer than 883. But 883 series has a good seat and more popular. Sonic which is serviced by this series is called “White Sonic”. 885 series equip the leather seat for both Green and Ordinary. It looks good and have very sophisticated atmosphere, but this seat is a bit slippery and has leather smell. The seat configuration on Green class 1+1+1 and the seat pitch is 1150 mm. The seat pitch on Ordinary class is 980 mm. The seat in car #2 of some train sets have the power outlet. You will see lots of Japanese modern art in this car. You can enjoy this car as art gallery. This train is called “Wonderland Express”. When this train was introduced, the eccentric design was in the news. But now this train was renovated. This eccentric design had gone. But you will still see some originative items in the car. Green class has a lounge space just behind cockpit. You will get the power outlet at window seat on car#1, both Green and Ordinary. I believe there will be the extra train running but any information has not been released yet. Usually fall train schedule will come up in early summer. Hello, bit of an odd question but is it possible to see the 883 series on the Kagoshima Main Line south of Hakata? I’m thinking maybe heading to the Kumamoto maintenance depot. I am building an n scale layout based on my favourite Kyushu trains and want to include the 883 but only if it would be seen in real life south of Hakata. Thanks. 883 series run between Hakata ana Oita only. It does not run on other segment except very special operation. You cannot see this train set in Kumamoto. Is there a specific time or train number to be able to take 883 Sonic? I will have a Green Pass and Green Car on 883 is much nicer than 885. Or is it based on luck? I will be getting the Northern Kyushu 3 day Rail Pass for my trip to Fukuoka this September. I think I can only exchange the pass at the JR Counter when i reach Japan. Can i reserve the seat for both Yufuin no Mori & Sonic Train online first? I’m looking to get the JR All Kyushu 3 day pass as I’m thinking of making a day trip to Kagoshima from Hakata and the another day trip to Beppu from Hakata. Would this be the best ticket to purchase ? Also, I noticed that I can make online seat reservations for this ticket but it does not cover the Kyushu Shinkansen (for Hakata/Kagoshima) and Limited Express Sonic (for Hakata/Beppu). How do I make a seat reservation for those trains or is it not covered by the All Kyushu pass ? Kyushu Rail Pass is the best choice. You can book a seat for Shinkansen and Sonic when you exchange the pass. It’s quite easy to book these trains because these trains run very frequently. You can use Kyushu rail pass 3 days for trip to Beppu. is it worth to buy a jr pass for my plan trip to osaka (flying in osaka), kyoto, nara then to fukuoka , beppu all with return trip. what type of jr pass do i need and can i buy the pass on arrival at osaka airport or online. The combination of Sanyo Sanin area pass and Northern Kyushu Rail Pass is most affordable choice. Japan Rail Pass covers all part of trip. But above two passes combination is slightly cheaper. You have to complete Fukuoka and Beppu in 7 days period anyway. You don’t need to include Kyoto and Nara if you cannot.